The magazine has been endorsed by leading industry bodies. These include the Visual Industries Suppliers Association, The Screenprinting and Graphic Imaging Association of Australia, Australian Sign and Graphics Association of Australia, The New Zealand Sign & Display Association and The Australian Engravers and Signmakers Association. 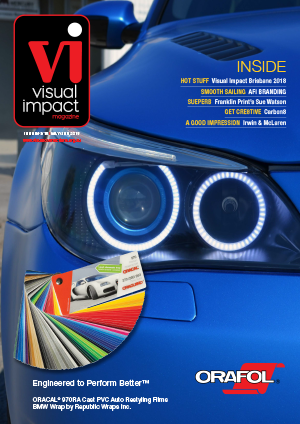 Visual Impact Magazine should be included in your overall marketing strategy. It is not a marketing luxury, it is an investment that will lower the cost of selling directly, by pre-selling your company and your various products. Published six times a year with four print issues and two online digital issues. These are distributed in January, March, May, July, September and November.